Free Shipping Included! 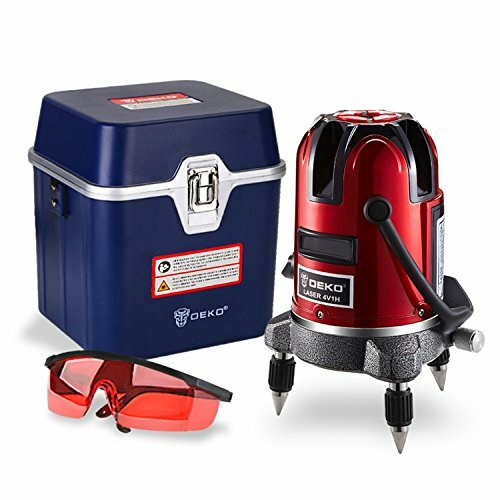 Laser Level Tool Self Leveling Laser 5 Line 6 Point 360°Rotary Kit Vertical and Horizontal Cross-Line Laser Levels with Outdoor Mode and Tilt Mode by DEKOPRO at N Online Agency. MPN: XG8. Hurry! Limited time offer. Offer valid only while supplies last. ★Intelligent Adjustment Automatic self leveling mechanism. Audio warning when beyond auto leveling range. Automatic leveling in the range of ±3°. Automatic self leveling mechanism. Audio warning when beyond auto leveling range. Automatic leveling in the range of ±3°. This locking switch, keep the laser leveler shut off if the points are out of leveling range. Locking pendulum to help prevent damage to internal components. High leveling accuracy at 3mm and 360°fine adjustment platform for maximal precision. Light and easy-to-carry with plastic case providing quick and convenient mobility. The laser level self leveling is designed to endure tough job site conditions with sturdy over-molded construction, built to an IP54 rating for splash and dust protection. If you have any questions about this product by DEKOPRO, contact us by completing and submitting the form below. If you are looking for a specif part number, please include it with your message.